When most people envision Beaufort, they think of strolls through charming downtown streets, cruises through picturesque waterways, and a myriad of explorations that traditionally take place close to sea level. But vacationers with loftier expectations can take their vacation to new heights – literally – by embarking on an aerial tour of the region via a hang gliding lesson that glides over the scene thousands of feet into the air. Not for the squeamish, but accessible for flyers of all abilities, this adventure is a unique new way to experience the Beaufort area, and will be a stunning component of any Beaufort vacation that visitors will never forget. Once a hang gliding lesson has been scheduled, on the morning or afternoon of the trip, flyers will take to the skies on a light sport aircraft while a trained instructor outlines the experience as well as any necessary safety instructions. Once the aircraft has reached the ideal height for flying, riders will be strapped to a professional hang glider, and will be launched from the tow plane to drift into free flight thousands of feet into the air. The instructor will take the reins, for the most part, and will expertly glide the free-flowing hang gliding craft through the air where incredible views of the landscape can be admired with ease. After a few minutes of flying, the hang glider will touch down on a grass airstrip close to town, where visitors can easily return to their central Beaufort launching point. The entire experience – depending on the type of trip – takes just a few minutes, but the aerial views and heady feeling won’t soon be forgotten. Best of all, because the rider is literally connected to the professional flyer, there’s no worry about flying abilities or skills – in essence, tour-goers can simply lean back, (or lie back as the case may be), and enjoy the ride. There are several tour options available for potential high flyers, ensuring that visitors can have as relaxed or as thrilling an adventure as they choose. The 2000′ ft. high Tandem Hang Gliding Lesson / Flight is a great option for hang gliding beginners who have never flown before, and who want to get their feet wet in this exciting aerial sport. On this flight / lesson, riders will be guided behind a slow flying airplane and will even have an option to take over the controls while in mid-air to get a feel of how easy it is to glide through the skies. After a few minutes of soaring in the skies, the expert guide will touch the hang glider down on a grassy airstrip, completing the journey. The duration of this flight is roughly 10-15 minutes, and it is open to riders of all abilities who are 10-years-old or older. This flight is designed for thrill seekers who want to take in the most stunning views imaginable of the Crystal Coast. Launching from the Michael J Airport and soaring 5,280’ ft. above the terrain, this flight presents outstanding vistas of the Cape Lookout National Seashore and the Cape Lookout Lighthouse, the Rachel Carson Coastal Estuarine Reserve, the downtown area, the Intracoastal Waterway, and much, much more. Lasting for approximately 25-30 minutes, flyers will have ample time to grab hold of the controls and test their skills as they take in some of the most incredible bird’s eye perspectives of the coastline. This flight is open to flyers of all abilities, thanks to the assistance of a professional guide, and is appropriate for potential flyers who are 10-years-old or older. A hang gliding adventure may be much less expensive than you’d think! Flights per person generally start at around $175 or so, and special discounts or promotions may be available – especially during the less populated fall and spring off-season months. Flyers can make their memories last even longer with a video recorded of their trip! The flight will be recorded from start to finish, and fliers can purchase the footage ahead of time, or from the instructor(s) directly on the day of the flight. Flyers should note, however, that they will be unable to attach their own cameras to the glider to ensure the safety of the rider and the functionality of the equipment. As of July 1, 2016, all riders must be at least 10-years-old to comply with safety regulations. With that being said, riders of all abilities are welcome to take flight, and no experience is needed to enjoy a hang gliding adventure. Got hooked on hang gliding after your flight? Then plan another vacation to the Outer Banks. 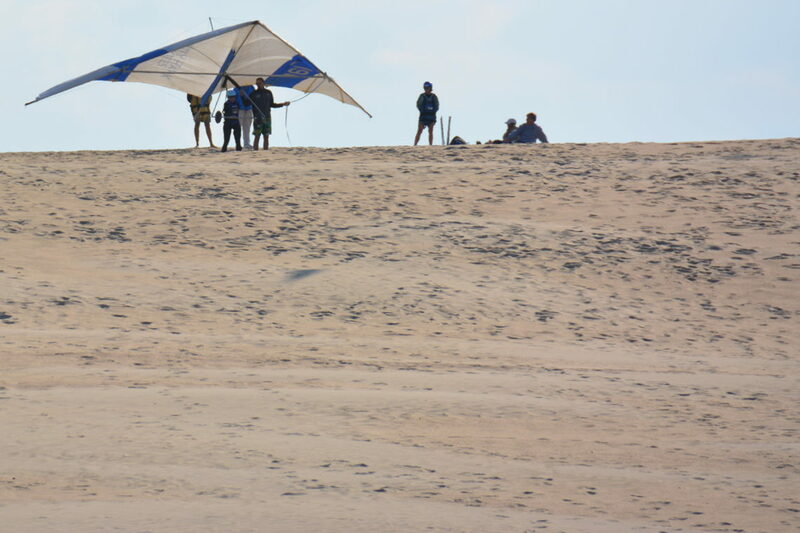 The town of Nags Head and Jockey’s Ridge is renowned as the Hang Gliding Capital of the East Coast, and there are countless more hang gliding adventures waiting just a few hours’ drive and ferry ride away. While Beaufort is best known for its array of water cruises and walking tours, hang gliding is a unique experience that is readily available, and which will truly take visitors’ breath away. Cross off a thrill-seeking bucket list item while enjoying some of the most beautiful views the region has to offer, and make a hang gliding flight and lesson a highlight of your upcoming Crystal Coast vacation.